The article analyzes experience of public-private partnership in renewable energy in developed and developing countries. We consider the most outstanding illustrations in the US, India and China. We study Russian practice and give recommendations for the development of PPP in renewable energy sources (RES) in Russia. Lanshina T.A. (2017). Public-Private Partnership in renewable energy [Gosudarstvenno-chastnoe partnerstvo v vozobnovlyaemoy energetike]. Public-Private Partnership, 4(3). (in Russian). – doi: 10.18334/ppp.4.3.38576. Bylym E.S. (2013). Perspektivy finansirovaniya gosudarstvenno-chastnogo partnerstva v Rossii na sovrmennom etape [Prospects for financing public-private partnership in Russia at the current stage]. Vestnik RUDN, seriya &laquo;Ekonomika&raquo;. (5). 188-195. (in Russian). Cedrick B.Z.E., Long P.W. (2017). Long P.W. Investment Motivation in Renewable Energy: a PPP Approach Energy Procedia. (155). 229-238. Martins A.C., Marques R.C., Cruz C.O. (2011). Public-Private Partnerships for Wind Power Generation: The Portuguese Case Energy Policy. (39). 94-104. Mataev T.M. (2014). Formy gosudarstvenno-chastnogo partnerstva pri realizatsii infrastrukturnyh proektov [Forms of public-private partnership in the implementation of infrastructure projects]. Journal of Public-Private Partnership. 1 (1). 9-20. (in Russian). McGowen J., Knoshaug E.P., Laurens L.M.L., Dempster T.A., Pienkos P.T., Wolfrum E., Harmon V.L. (2017). The Algae Testbed Public-Private Partnership (ATP3 ) framework; establishment of a national network of testbed sites to support sustainable algae production Algal Research. (25). 168-177. Zavyalova E.B. (2015). K voprosu o tselesoobraznosti GChP v obrazovanii [On the usefulness of PPPs in education]. 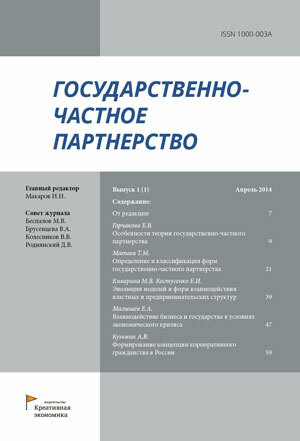 Journal of Public-Private Partnership. 2 (4). 217-226. (in Russian). Zavyalova E.B., Shamanina E.A. (2016). Obzor monografiy, posobiy i rekomendatsiy v oblasti razvitiya i primeneniya mekhanizma gosudarstvenno-chastnogo partnerstva [Review of monographs, manuals and references on public-private partnership development and application mechanisms]. Journal of Public-Private Partnership. 3 (3). 201-211. (in Russian).